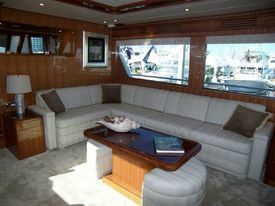 It feels just right with the Hampton 686 yacht! Hampton Yachts was established in Taiwan in 1992. Since then, it has grown into one of the first Taiwanese shipyards to begin with yacht manufacturing in China. Nowadays, the shipyard is operated by more than 200 zealous and diligent craftsmen, designers, engineers, and architects. Even though their ancestry started in Taiwan, their prosperity has become a red-hot, worldwide story. During their progression, they started collaborating with Naval Architect Howard Apollonio during which they came up with the Hampton Hybrid Hull. The hull is a synthesis of the best aspects of planing and displacement hulls. The avant-garde chine cuts wave-making resistance. 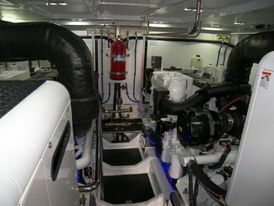 Other Hampton yachts' innovative designs include hull lay-up and finish, cockpit controls, frameless windows, running gear, shore power, stabilizers, safety, interiors novelties and many other features. The Hampton 686 has come to light with all these unique traits with her first-class appearance and performance. The yacht brings forth a superior industry list of standard equipment. She offers a fully enclosed and equipped Skylounge, is garnished with extraordinary safety, productivity and has the finest performance. Let’s get into the Hampton 686 review. The overall length of the Hampton 686 is 71 feet and 2 inches with a beam of 18 feet and 10 inches. The design is very similar to the Skylounge version of the 680 LRC Motor Yacht. These similarities refer to the completely enclosed and equipped Skylounge. 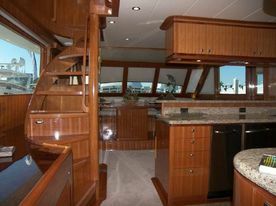 Nevertheless, the Lower Helm is substituted with “a larger curved banquette style dining area across from a peninsula galley bar". Regarding the performance, she is endowed with the twin Caterpillar C-18 with engines capable of 1150 horsepower. This dreamboat can reach the top speed of approximately around 22 knots. The cruising speed is somewhere around 17 to 19 knots. If the skipper decides to ply the ocean with the speed at 8 to 10 knots making a very long range, then the fuel burn will be greatly reduced. The stats show it all. This fantastic performance is managed due to the skillful design of the boat. Essentially,the Hampton Hybrid Hull is directly associated with her performance. A mix of race boat and sail boat traits are integrated to provide more discreet stability during the ride. Accordingly, the lower chine gradually vanishes in the forward third of the hull. A thorough and precise proportion of the hull’s basic form is additional step-up. Starting from the fully enclosed bridge, one can notice that the entire interior is tastefully and ergonomically arranged. 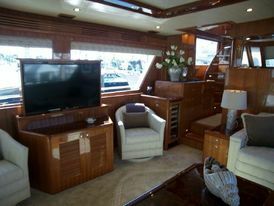 A friendly pilothouse is luxuriously flooded with a glossy wood finish. The helm station comprises two chairs for the pilot and co-pilot. The comfy white leather chairs can swivel, be adjusted and they both have an armrest and footrest. The dashboard is quite impressive with three extra large displays and different features like GPS, autopilot, compass, plotter, radar, navigation center radio etc. One can step to the below deck via stairs which are situated to port of the helm. The wheelhouse lounge contains a work desk to port and an L-shaped settee with two tables to starboard. But that’s not where it end. 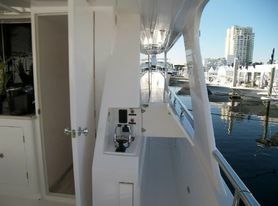 If one goes through the elegant sliding door, they will find themselves in the flybridge aft. A magnificent galley with a grill, sink and fridge complete the social aspect of the flybridge creating a pleasant atmosphere for social gatherings during the nice weather. The Hampton 686's layout is definitely something to show off to your guests. The warmth and elegance of the boat continues when going down to the cockpit via the stairs located in the aft part of the flybridge. The stainless steel handrails boost the safety of the boat too. The cockpit is spacious with a glossy, extended and rounded table. A small Day Head is provided with lots of tiny details making it an enjoyable and out of the way space. A sliding blackened door leads to the main saloon. A partly divided saloon also contributes to the conversation area. An extensive settee and armchair with a table are set to starboard while two armchairs are placed to port. The area is greatly flooded with natural light through numerous windows and through aft part if the sliding door is opened. Overhead LED lights supplement the lighting part. The entertainment set up comprises 46 inch LED HDTV with Bose “Life Style” surround system. One step and one is in the main corridor where the galley is situated. 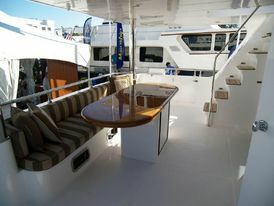 The galley serves as a border between the saloon and the dining area and its open design offers a clear view to the aft deck settee. The granite countertop adds a splash of elegance to it. It is furnished with a huge SubZero refrigerator and two freezer drawers, cooktop, microwave, oven, dishwasher, sink, garbage disposal and many drawers and storage space. The dining area is the last point before the bow. An elevated U-shaped settee and a cherry table lure the passengers to this part of the boat. 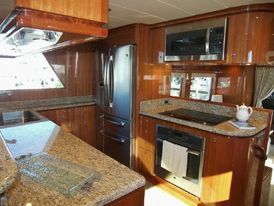 The lower level of the Hampton 686 is highlighted with a profound layout and space. A remarkable ensuite Master Stateroom features a king size bed with storage underneath, a 32 inch LED TV, portside vanity with storage drawers and stereo CD/DVD AM/FM player sound system. Dimming control for LED lighting is just a testimony of details which the engineers paid attention to. A classy Master Head with cherry vanity and under counter sink provide everything one needs. Granite countertop and granite floor, together with a large FRP shower stall lined with Corian, complete the uppermost level of the divine layout. The VIP stateroom is all the way forward and encompasses a queen size bed with built-in storage drawers underneath. If one wants to watch TV, there is a 26 inch LED TV at their disposal. The décor is simply stunning with LED courtesy lights and LED overhead lighting with dimming control. There is a skylight with an Ocean-Air screen above the berth. The VIP Head has similar features as the Master Head. 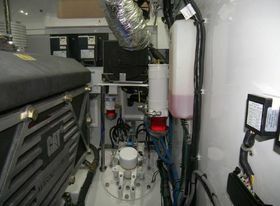 There are two berths that occupy the crew quarters with an ensuite head. The Hampton 686 is a powerful yacht that incorporates a set of fundamental features that operate together synergistically. 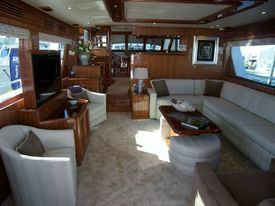 Effectiveness, comfort, safety, entertainment and fine finishings are nicely intertwined into this dream yacht. It just feels right to be onboard of the Hampton 686. What are you waiting for? Contact us immediately and get onboard. Don’t miss out the opportunity to complete your life with a beauty such as this. Make an inquiry!